The Lunar New Year signifies the coming of Spring. With Spring comes the thawing away of the icy freeze of Winter and a time to start things anew. If the Chinese and Singaporean leaders wanted a poetic time to toss this whole terrex/south china issue out and start again, there would not be a better time than now. Foreign policy experts agree bilateral ties would be normalising sooner rather than later after Chinese Vice-Foreign Minister Liu Zhenmin’s ( 劉振民 ) visit to the Republic. At this meeting, Yusheng was tossed by top government officials of Singapore and China last week. 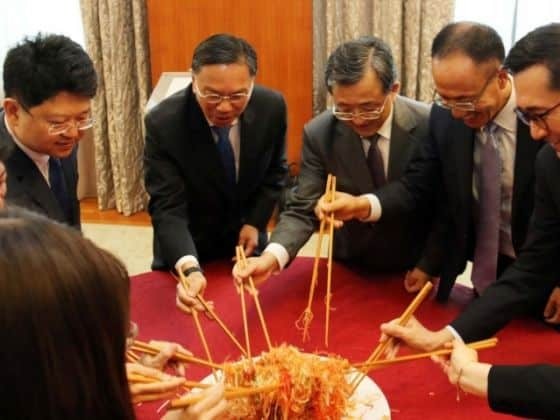 If Sino-Singapore relations are returned to normal, it would be the most powerful yusheng toss in history. The first high level forum (anticipated) to be held in February 2017, would be the Joint Council for Bilateral Cooperation (JCBC). This would be co-chaired by Deputy Prime Minister Teo Chee Hean and Chinese Vice Premier Zhang Gaoli. When the meeting takes place, it would happen in an environment where ASEAN and ASEAN bodies will be celebrating their anniversaries and where a new President of the United States is adopting a more confrontational stance towards China. Feng Zhang, an adjunct professor at the National Institute for South China Sea Studies in China, told the South China Morning Post that in the light of these events, restoring the relationship with Singapore to normal makes sense. “China is planning some activities to commemorate these anniversaries and generate new momentum for East Asian cooperation,” Feng said. Prime Minister Lee had said that Singapore and China have “strong levels of cooperation” even though the “two countries are different” and it is “normal that they don’t see eye-to-eye on every issue all the time”. PM Lee had made the following quote in September, but it still remains fresh to use: “We accept that there will be some times when there are issues, and things may take time. This is normal between any two countries, particularly two with a very close relationship,” he added. I think the Year of the Rooster may bring optimistic news yet.